XI'AN, China, Jan. 16, 2019 /PRNewswire/ -- LONGi Solar has announced that it has achieved a new monocrystalline silicon PERC world record conversion efficiency using commercial wafer (M2) dimensions that exceeds 24 percent for the first time, according to tests carried out by the National Center of Supervision and Inspection on Solar Photovoltaic Product Quality (CPVT) in China. 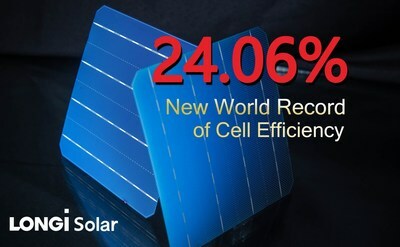 "This is the first time that the efficiency of monocrystalline PERC solar cells in commercial dimensions have exceeded 24%," remarked Dr. Li Hua, LONGi Solar, Vice President of Cell R&D. "In the last three consecutive years LONGi Solar has developed three generations of 'Hi-MO' products based on PERC technology, which are setting the efficiency and reliability benchmark of high-efficiency PERC technology within the industry.